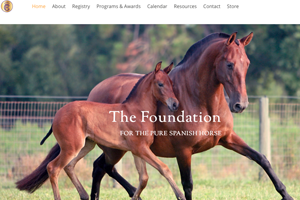 New Website for The Foundation! We have been working to modernize and create a website which reflects our main operations; Registry, Education, Revision, and Rescue. Our site works equally well on a smart phone or a computer to be accessable for all. 2018 Stallion Auction is Underway! Check out the Hot Bachelors! 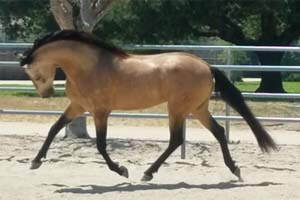 Our Annual Stallion Service Auction is ON now through March 1 at biddingowl.com/PREHORSE. We now have 8 FABULOUS stallions. The terms are standard and the breeding is good for the 2018 year. Start your Bidding! These are truly OUTSTANDING Stallions. All are Registered and Revised and their foals can be Registered with all P.R.E. Registries as "P.R.E." if the mare has also been Revised. ​If you would like to add your Farm or Business logo as a Sponsor to scroll on the pages, you may do so for $75. 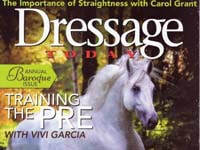 Email info@prehorse.org to discuss. This Auction is advertised and linked on our Facebook page with a reach of more than 1500 per week, Newsletter with more than 4000 subscribers, and Twitter with 973 following. Donating to the Stallion Auction is not only good for The Foundation, it is good publicity for your Farm and Horses! Although Bidding is ON, it’s not too late to include your Stallion. 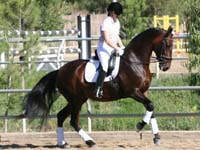 For a Quick Start: Submit your Stallion Name and web site to director@prehorse.org. 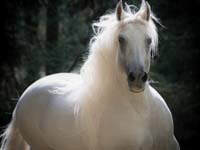 If you have a web site or page for your Stallion most of the information can be taken directly from it. The Spring Revision is looking to be quite a busy one. Dates have been pushed back a bit because the Judge will be in Australia until May 10th. He will arrive in California May 11th. We will be making an initial mapping of Applications for Revision during the week of January 15 to determine possible Revision Sites. Our goal is to have Revision Sites throughout the country so that everyone who wants to Revise a horse or have the Spanish Military judge, Inscribe and advise them can participate. Remember Revision is one of the best ways to ensure quality and improvement in any Breed and we should be willing to set the standards. Please Note Registry Fee Change: Revision is now $245 for Members. 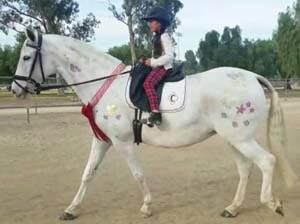 Mario Segovia’s three young girls were thrilled on Christmas Day when their father presented them with the mare Betica del C. The mare had been body clipped, glitter hearts and stars applied all over her body, and a Santa cap at her poll. This beautiful mare was instantly surrounded by the girls who gave her many hugs and kisses. And then, of course, she was saddled and ridden immediately. Betica del C had been the pampered star owned and trained by Nadine Tilley. 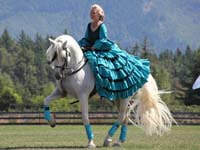 Betica was a champion riding horse (many wins at IALHA shows) as well as a driving horse (again awards at IALHA and open driving competitions). When Betica’s show career was over, Nadine bred her, then kept her as a much loved retiree. Nadine had offered the mare to Barbara Currie so that she could recover some of the old lines that were part of her program. But, a better life for Betica came in the form of Mario who comes from a family where all members ride and his girls are all horse-crazy. What better surprise for them than to have a trained mare ready for Christmas? So, with permission from Nadine and a hole in the Currie breeding program, Betica is now hugged, groomed, pampered, and ridden by all members of her family. She has returned to the stall and is, once again, Queen. Isn’t this what Christmas and the Pure Spanish Horse are about? Registering Transfers – Who Really Owns Your Horse? When you purchase a horse that is registered/inscribed with Carta Mundial, the seller will give you the original Carta and a Bill of Sale. Until you complete a Transfer of Ownership the Bill of Sale is your ONLY legal proof of Ownership. If you lose or misplace that one piece of paper, legally the horse belongs to whoever has their name on the Carta (Registration Documents). 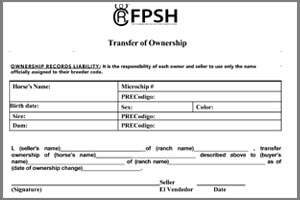 In order to safeguard the Proof of Ownership, you must transfer Ownership through the Registration Process. The Foundation will verify your purchase, record the change and reissue the Carta in YOUR name. The Carta is then returned to you for safekeeping. The Foundation’s Records of your Ownership are stored locally and remotely on Secured Servers with multiple back-up in our databases. A $35 Transfer of Ownership fee is a very inexpensive way to ensure your legal rights. Breeders and Sellers, please keep the Registry informed of the status of your horses. You can email the Registry directly to let us know you have sold a horse and to whom. The Registry will follow up to encourage new owners to register their transfers when they purchase a horse. Should the horse become lost or stolen, or the buyer lose the Bill of Sale, Registry records may become a necessary legal resource in the recovery of a horse. Accurate records also give the Registry the Information to contact Owners and keep them advised of important issues. 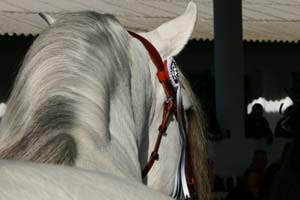 Bajas: Reporting the Death of your beloved horse is a sad and unpleasant task. However for the sake of the breed records it is necessary. For those who admired him or her it is an opportunity to honor the life of an individual who may have been a champion and /or a cherished companion. We would like to Congratulate the Following Horses along with their Owners and Riders for their Excellent Performance during the past year. It takes a lot of hard work and dedication to reach these levels of competence. The Foundation has ordered beautiful trophies for each winner to mark these accomplishments. With great pleasure we announce that our mare Nexus GF, bred by Lanys Kaye Eddie, will be coming out at 4th level in Dressage this year. We are so excited with her progress under the tutelage of Kim Elsner of Autumn Breeze Training. This is a dream come true. Nexus is really enjoying her work and takes to Passage and Piaffe with a beautiful relaxed natural gait. We have high hopes for her as she begins her upper level work. Thank you Kim Elsner for the wonderful patience and expertise you have shown our girl; and to Lanys Kaye Eddie for breeding such a talented mare. We had a Great 2017! Please Click Link below for our News! Happy New Year from very cold Florida. 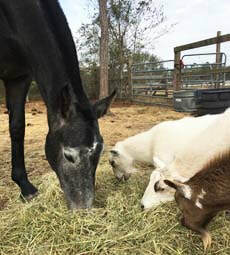 I had to share with you that due to Fortuna’s amazing beauty and kind nature, I opted to not put her with my other horses as one is prone to be a bully and instead put her in a 3 acre pasture with my daughter’s three goats; Sugar, Spice and Dumpling. She is now referred to as the “Mother of Goats.” She feeds them from her mouth, shares her alfalfa and they literally stand underneath her belly as they share her food. They run together as well. I hope my trainer is ok that I may be traveling with goats on the first few trips….LOL. * My daughter and I nicknamed her “Prada” ….it just fits and she seems to like the sound of it. She will run to the gate when she sees me coming.